Whether navigating negotiations with Harvey Weinstein over final cuts or clashing with high-powered CAA agents over their clients, Hope offers behind-the-scenes stories from the wild and often heated world of low-budget cinema—where art and commerce collide. As mediator between these two opposing interests, Hope offers his unique perspective on how to make movies while keeping your integrity intact and how to create a sustainable business enterprise out of that art while staying true to yourself. 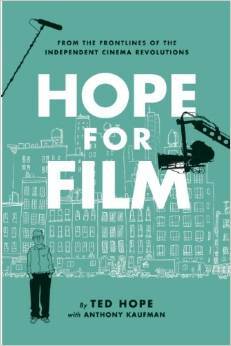 Against a backdrop of seismic changes in the indie-film industry, from corporate co-option to the rise of social media, Hope for Film provides not only an entertaining and intimate ride through the ups and downs of the business of art-house movies over the last 25 years, but also hope for its future. This entry was posted in Books and tagged Ted Hope on August 31, 2014 by n1ch0la5b0lt0n.